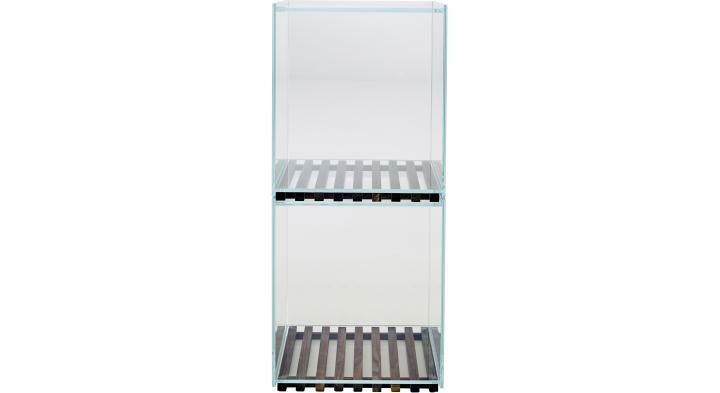 Storage module (stackable) comprising a cube of 1/4'' - 8 mm thick toughened ''cristal'' glass set on a base of natural satin varnished solid American walnut. Elements are simply placed on the ground and are not fixed in any way. The edges of the glass cube rest half way down the slatted walnut base in such a way that they do not rest on the ground and do not touch each other when superposed. It is not advisable to stack more than 3 modules. The dimensions of the cube alone are: 14 1/2'' - 36.6 cm x 13 3/4'' - 35 cm x H 15 1/2'' - 39.8 cm. The dimensions of the walnut base are: 13 3/4'' - 34.8 cm x 13'' - 33.2 x H 3/4'' - 2 cm. H 16" x W 15" x D 14"